Geyer’s biscuitroot is often the first flower seen in the spring, blooming as early as February. 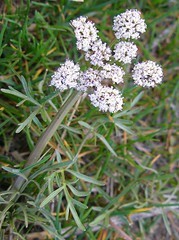 It is easily identified by the tiny white flowers growing in umbrella-like clusters called umbels. Stems can be green or red, and its leaves attach to the stem at or below the ground surface. The dark-green, very narrow, divided leaves give off a strong, rather unpleasant, parsley-like odor. Biscuitroots typically bloom on a short stem which greatly elongates as the fruits ripen, growing two to three times the height of the initial stalk. This species grows to a final height of six to twelve inches. Biscuitroot stores energy as starch in a fleshy, tuberous or bulb-like, root just a few inches below the ground. This root was a significant portion of the local Native American diet. The root was collected, eaten fresh, baked like a potato, or dried and then ground into flour. The roots were dug only after seeds set to avoid a taste like turpentine.